Long before The Streets and Lady Sovereign made British rap fashionable, there were Pet Shop Boys. Most people don’t think of the dance-pop duo as a rap act, but lead singer Neil Tennant begs to differ, calling the new-wave classic ‘West End Girls’ an early example of U.K. rap. In the 20 years since ‘West End Girls’ became a No. 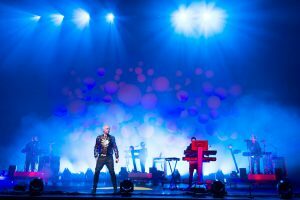 1 hit in the United States, Pet Shop Boys have dropped the rap and instead made a name for themselves as social satirists, openly gay icons and restless musical experimenters (they recorded a Latin-flavored album called ‘Bilingual’ and wrote the musical ‘Closer to Heaven’ with playwright Jonathan Harvey). They also stand as two of the best songwriters in pop, able to match their cheeky, often cynical lyrics to snappy dance-floor tunes. Their latest album, ‘Fundamental’ (Rhino), is their most politically pointed yet, but the messages are anything but overt. ‘I’m With Stupid’ describes the relationship between Tony Blair and George W. Bush (it’s sung from Blair’s point of view), but it also works as a bitter ballad about a romance gone wrong. ‘Indefinite Leave to Remain’ could be a simple plea from one lover to another, but the phrase also refers to a type of U.K. visa for foreign visitors. ‘Fundamental’ features one of Pet Shop Boys’ least likely collaborations, with songwriter Diane Warren, who has written hits for Celine Dion, Aerosmith, Ricky Martin and others. She gave the duo ‘Numb,’ originally written about her mother’s death. But even those lyrics (‘Don’t want to hear the news/ What’s going on’) have another meaning for Tennant.